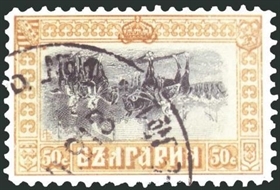 The most expensive BG stamp - "Reversed Cavalry" (see the photo above), evaluated at about 10,000 BGN, will be exhibited at the National Philatelic Exhibition PLovdiv 2008 (Oct.16 to 19). The exhibition will feature about 50 collections competing for the Most Beautiful Stamp award. The exhibition is dedicated to the 100th anniversary of the Independence of Bulgaria, and the 115th anniversary of the Philatelic Society in Bulgaria.